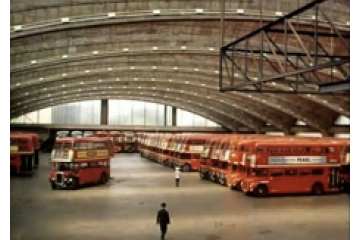 London's public transport companies have been using moving images to promote services and train staff since the early years of the twentieth century. Although the film collection inherited from London Transport in the 1980s is perhaps best known for the documentaries made by British Transport Films in the 1950s and 60s, the collection stretches beyond this time frame in both directions, going as far back as 1910, and including video tapes and digital media from the 1990s to the present day. London Transport Museum collects and displays the legacy of two centuries of public transport in London; not just vehicles, but posters, artworks, maps, photographs and, of course, film, to demonstrate the central role of transport in the vitality and identity of one of the world's great cities. The museum is a registered charity, and is open daily in Covent Garden, with regular tours and open days at our Depot store, Acton Town. Access: Some material online at http://www.ltmcollection.org/films/index.html Viewing of other material, in digital form or on tape, at our Acton store by appointment with a specialist curator – please book at least 2 weeks in advance. My favourite film in the collection has to be All That Mighty Heart - a wide-ranging film completed in 1963, but similar in feel to the 'City Symphonies' of the 1920s and 30s, showing the public transport system in perfect harmony, from 5am to past midnight . I must have seen it fifty times, but the changing tempos of a day in London, set to the BBC radio themes and continuity announcements never fail to charm. Much of the camerawork is by future Oscar-winner David Watkin, with most material shot in the mid-1950s, plus extra footage shot in 1962 to bring it up to date.